From Fifteen Trees with Love. Home/Blog, Tree Plantings, Tree Plantings in Victoria/From Fifteen Trees with Love. Every year, Fifteen Trees acknowledges our supporters by organising the planting of one tree on the behalf of every Fifteen Trees subscriber. At last count, we have 210 lovely peeps who subscribe to our E-News (which comes out 4 times/year). So, out we went and we purchased 210 trees for Chris Cobern and the Upper Goulburn Landcare Network. This is truly beautiful countryside. Nestled in the hills and valleys of central Victoria, Chris and his team have been looking after this particular part of Victoria for many, many years. We knew the trees would be in good hands. 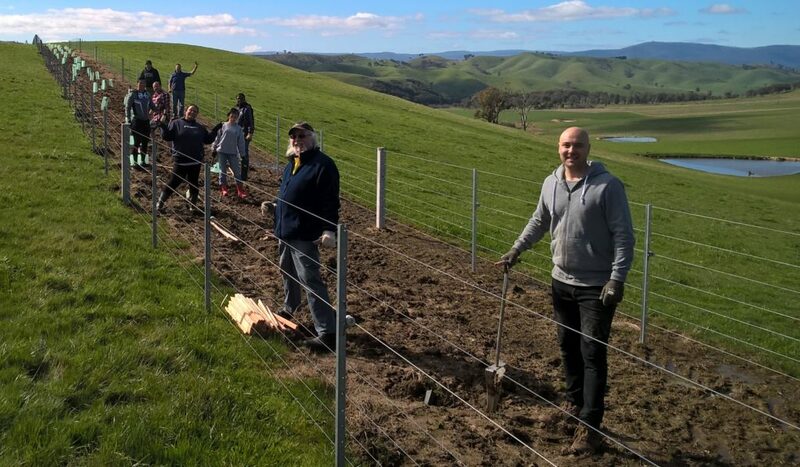 The Upper Goulburn Landcare Network recently held a planting day on a farm near Kinglake. With the help of corporate volunteers from ANZ and members of the Kinglake Landcare Group, we planted trees and shrubs kindly provided by Fifteen Trees. The plants will help revegetate this fire ravaged property. As well as providing wind protection for stock and habitat for native wildlife they will also help protect against erosion on the steep hill side. So, from us to you … thank you for keeping an eye and an interest on what we do. THESE TREES ARE FOR YOU. By Colleen Filippa|2018-09-13T15:54:47+10:00September 13th, 2018|Blog, Tree Plantings, Tree Plantings in Victoria|Comments Off on From Fifteen Trees with Love.